Do you remember the first thing you and your significant other ate together? Think back - in any of your relationships, current or past, do you remember the first thing you and your significant other ate together? Mark and I are coming up to six years this August since we began dating. We were set to meet each other in-person (we had chatted online, but never met) by the fountain at the Eaton's Centre and from there we were planning to go to the Chinese Lantern Festival. It was actually me who asked him on our first date because I didn't have any family or friends who were interested in coming to the festival and he seemed nice and we really enjoyed chatting to each other online, so what the heck - why not! Must say it was the best decision I've ever made! Upon meeting at the fountain, Mark surprised me with a lovely little bag of Monsieur Felix and Mr. Norton cookies which we munched on together while we rode the streetcar. 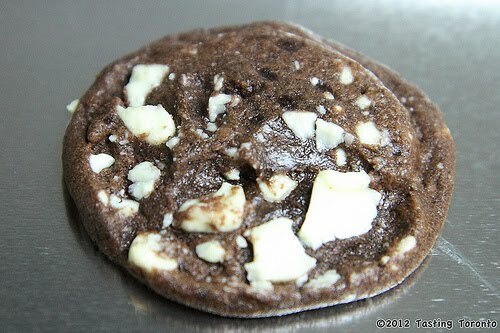 I have a fond memory of that day, and also of those cookies - I had never had them before. 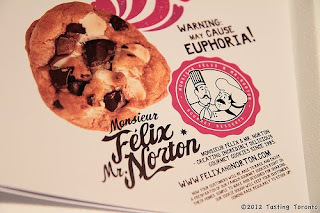 So when we heard from the folks at Monsieur Felix and Mr. Norton a couple weeks ago, we were thrilled because we hadn't really seen any of their storefronts in downtown Toronto anymore and we missed their soft, chewy cookies. We tried out their frozen cookie dough, available at Sobeys (check out this product locator to see exactly where you can get them). Actually, since you bake them yourselves, they work out to be cheaper than buying them from the storefront. There's also the convenience involved with having them on hand anytime, and you could tell the quality of the ingredients was good. They tasted exactly like the ones we remember (just make sure you don't overbake them). I prefer the container packaging to the ubiquitous cookie dough tube packaging because the cookies are already pre-cut so there is no need to fuss with it. The funniest part was all I wanted to do was eat the cookie dough, while Mark demanded continually that we bake cookies like normal human beings do :) I know eating cookie dough is not really considered safe and, as I recently learned, it's not necessarily the raw egg that can be an issue but it can also be the flour that poses a concern. As people in the comments of that article say, there are much riskier things we do everyday and the sheer joy we get from eating raw cookie dough is just something most of us are not willing to give up!